For the first time, I am able to host my father and youngest sister at our home in Minneapolis. As expected, there is a tremendous amount of sight-seeing they would want to accomplish, and there are many things my fiance and I want to share with them, aspects of our life here that must be experienced first-hand, such as the twin cities' fabulous restaurants, our daily lake walks, among other things. It seems that I am more excited that they are, actually. Before they arrived, I drafted an agenda for almost each day of their visit. 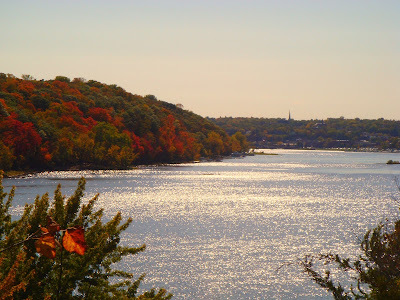 Friday's agenda was the St Croix's Scenic Riverway, 123 miles of beautiful forested landscape bordering central eastern Minnesota and wisconsin on the St. Croix River. The St. Criox river with the town of Stillwater, Minnesota in the distance. I have never made this drive before but was told my born and bred Minnesotans that the vistas are gorgeous this time of year. And boy was it so! Miles and miles of fall foliage, browns, reds, yellows, purples. On the shores of the St Croix, one can almost forget that the twin cites are just an hour or so away. Road trips, just like life, are highly unpredictable. About forty five minutes into the drive on the outskirts of the town of Wyoming, we drove past a pumpkin patch. I had never been pumpkin picking before and neither had my father nor my sister. We made a u turn and off we went cavorting through fields of bright orange pumpkins, despite the fifty degree temperature. No matter how old we get, there are some things that, when done for the the first time, bring out the child in us. I found out that a pumpkin patch can do that. There seemed to be an unspoken rule that fun must be had in this place. That evening at dinner, we all commented that the pumpkin patch was one of the highlights of the trip. Probably because it was so novel, and certainly for my dad because he was able to procure red, blue and purple corn which he plans to cultivate when he returns to Trinidad. Little did everyone else know that all the while, all I could think about was the pumpkin pie I would make from the fresh pie pumpkins we had bought. The fact that this would be a relatively labor intensive and time consuming endeavor did not faze me; I just had to experience this type of pie making for myself. The first thing I did was research on the different ways of pumpkin pie making. An online source suggested cooking the pumpkin in a microwave, removing the pulp, then letting it drain in a cheesecloth overnight to remove the excess liquid. This, I thought was a good idea until I stumbled on a Cooks Illustrated magazine which suggested cooking a can of pureed pumpkin on the stovetop to remove excess liquid. Why not implement this method for my fresh pumpkin pulp? Genius! I discovered exactly what the magazine explained. 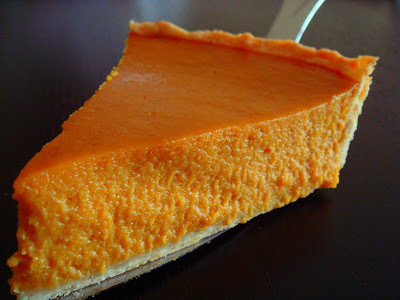 Cooking the pumpkin pulp/puree does three things: (1) it enhances the pumpkin flavor, (2) it makes the filling hot which allows the custard to firm up quickly while in the oven, and (3) it removes a significant amount of excess liquid which prevents the crust from becoming soggy. The other helpful tip was to bake the pie at an initial high temperature followed by a lower temperature to prevent the eggs from cooking. A mistake many cooks, myself included, frequently make is using a uniform high temperature to bake the pie; this produces a crumbly texture (because the eggs cook quickly) as opposed to the velvety texture produced by aforementioned method. As for the crust, I made my own but, by all means, you can use the pre-made version or your personal recipe if you prefer. The reason I make my own is I can control the amount of fat I put in. Everyone can agree that a pie without a good pie crust is no a pie at all, but I disagree that two pounds of butter must be used. In my recipe, I used only five tablespoons which created the right amount of flakiness that my family enjoys. Yes, the crust is somewhat thinner than your standard crust so one might assume that it would turn soggy easily. Not so at all. In fact, pre-cooking the pumpkin puree as described above removes much of the liquid thereby reducing the risk of sogginess in the crust. The resulting pie is unlike any that I have made form a can with a smooth and consistent texture and, best of all, the pumpkin flavor is intensified. 1. Wash and cut the pie pumpkin into eight to ten segments. Remove and discard the seeds and stringy interior. Place the "cleaned" segments in a large pot with 1 to 2 inches of water. Set over medium high heat for 30 minutes until the pulp becomes soft and capable of being scraped out with a spoon. 2. Using a spoon or ice cream scope, scrape out the pulp of each segment. Add all the pulp to a blender and puree until smooth. An emersion blender can also be used here. 3. Return the puree to the pot and cook over medium heat for 20 to 30 minutes stirring occasionally to prevent burning. This step removes some excess liquid and intensifies the pumpkin flavor. 4. Add the fresh ginger, cinnamon, and nutmeg, and cook further for two more minutes. Whisk in the evaporated milk, eggs, vanilla extract, brown sugar and maple syrup. 5. Pour the filling into a prepared pie crust, set on a baking sheet and bake in a preheated 400 degree F oven for 15 minutes. Reduce heat to 300 degree F and bake for a further 30 to 35 minutes. Remove dish to a wire rack and allow to cool for at least an hour before serving. Combine the first four ingredients in a food processor, pulse to mix. Slowly add the water one tablespoon at a time, until mixture begins to clump together. Remove dough unto a floured surface and shape into a round disc. Wrap in plastic wrap and refrigerate until ready to use, at least an hour. When ready to use, remove from refrigerator and let stand at room temperature for at least 5 minutes. On a well floured surface, roll into a 12 inch disc and place in pie dish which had been sprayed with cooking spray. Return to refrigerator until you are ready to add the filling. Just before adding the pumpkin filling, line with foil and fill with dried peas or another form of baking weights. Bake in a 400 degree F oven for 15 minutes. Remove the weights and foil and bake for a further 5 minutes. This is really helpful! I've never made a pumpkin pie from scratch, but I've got two pumpkins to use up right now. Very handy recipe. Your pie looks fabulous! So thick and creamy. Look at the colour of that filling! Wow that looks so luscious! Nice pie and yes good hints about cooking the pumpkin. I am from Trinidad and we always make pumpkin pie from a scratch. Great looking pie. I can't wait to try it. 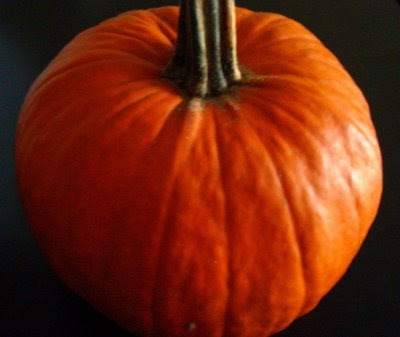 You should enter your recipe into the Better Recipe Pumpkin Pie Recipe Contest. We are looking for the best pumpkin pie recipes from the best food blogs on the web. The most beautiful pumpkin pie I've ever seen!! Color and texture look outstanding! Thanks for the inspiration.